Great for birders and families alike, this renowned state park provides outstanding opportunities to see wildlife. From the parking area by the visitor center on US 19/US 98, walk the Pepper Creek Trail for free. This trail is a paved, fully accessible tram road which leads westward through hardwood hammock and wetlands. Look for Yellow-bellied Sapsuckers and Black-and-white Warblers here, along with other winter birds. 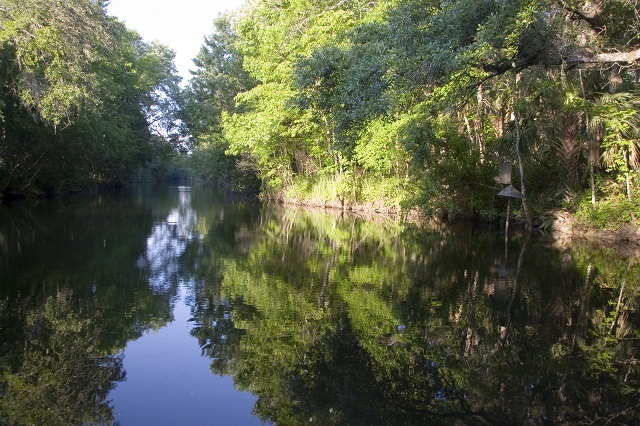 At the extreme west end of the park on Fishbowl Drive, either pay the entrance fee and visit the park proper, or return to the parking lot on US 19 via one of the park’s Pepper Creek pontoon boat tours (an interpretive tour included with the entrance fee). Wood Ducks, otters, turtles and more can be spotted along the park’s waterways. Native wildlife species such as Bobcats, Northern River Otters, Whooping Cranes and Red Wolves can be seen on exhibit in the Wildlife Park off Fishbowl Drive, and don’t miss the world-famous underwater observatory, where you can witness resident West Indian Manatees and numerous fish species swimming in the crystal clear waters. The park is part of a multi-agency partnership for the rehabilitation of injured and orphaned manatees. Wild manatees have access to the main spring during the winter months–watch for them in the Blue Waters area off Garden of the Springs. Educational programs featuring a variety of animals are offered throughout the day; call ahead for more details.